A proud alumna of Laurentian University, Tracy MacLeod is a highly motivated, results-oriented Certified Fundraising Executive (CFRE), with 20 years of experience in advancement portfolios at three Ontario universities. Since 2004, MacLeod has been serving as Director of Development and Campaign Director at Laurentian University, where she successfully led staff and volunteers to raise over $65 million through The Next 50 Campaign, the largest fundraising campaign in the history of Northern Ontario. 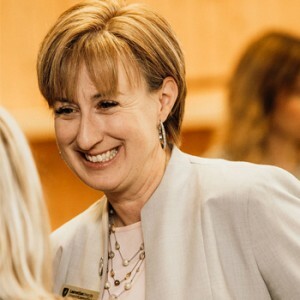 Most recently, she has been Acting Chief Advancement Officer since the incumbent Tamás (Tom) Zsolnay moved to the University of Victoria after 11 years of distinguished service leading Advancement at Laurentian University. Ms. MacLeod worked in Advancement at Laurentian University from 1994 to 1997, at Queen’s University from 1997 to 1998, and at Nipissing University from 1998 to 2004, culminating in the role of Manager of Alumni Relations and Development at Nipissing University. In 2013, she completed the Senior University Administrators Course from the Centre for Higher Education Research and Development. In 2011, Ms. MacLeod was one of the recipients of Sudbury’s Top 40 Under 40 Awards. She is currently serving as President of the Northeastern Ontario Fundraising Professionals Association. In 2006, she was the recipient of the Outstanding Volunteer Award from the Canadian Council for the Advancement of Education. She served as Treasurer and Vice-President of the Canadian Council for the Advancement of Education – Ontario, as director of the board of the Centre communautaire de Lavigne Community Centre and as an active member of the Rotary Club of Sudbury Sunrisers. The appointment of Ms. MacLeod was unanimously recommended after an extensive recruitment process by a 13-member search committee composed of past Board Chairs, members of the University’s Board of Governors and Executive Team, academic and non-academic colleagues, representatives from the LUAA and student associations, and direct reports in Advancement.